International Journal of Research in Health Sciences,2014,2,4,973-978. 1,2,4-Tutor, Karpagam Faculty of Medical Sciences and Research, Othakkalmandapam, Coimbatore, Tamil Nadu. 3- Assistant Professor, Tagore Medical College and Hospital, Rathinamangalam, Melakkottaiyur Post, Chennai. 5- Assistant Professor, Karpagam faculty of Medical Science & Research. 6- Professor & Head of the Department, Karpagam faculty of Medical Science & Research, Department of Microbiology, Tamil nadu, INDIA. Purpose: Diarrheal diseases are a major cause of morbidity and mortality among children in developing countries. Among the bacterial pathogens, diarrheagenic E. coli (DEC) are the most common agents causing diarrhea worldwide. The objective of this study was to determine the prevalence of DEC in stool samples from children with acute diarrhea using polymerase chain reaction (PCR). Methods: A total of 75 stool samples from children under the age of 15 with acute diarrhea were collected by aseptic measures for a period of one year. The selected samples were screened for E.coli by standard microbiological methods. Identification of pathogenic E.coli was based on cultural characters and standard biochemical reactions. The E.coli isolates were subjected for PCR analysis to classify as EPEC, EAEC, STEC and ETEC strains using their virulence marker genes. Results: 17 (23%) DEC isolates were identified from 75 stool samples. EPEC showed high prevalence (12%) followed by EAEC (5.33%) and STEC (4%). No ETEC strains were isolated from the population. Conclusion: The study showed that EPEC (12%) is the predominant strain among other DEC in causing diarrhea among children. 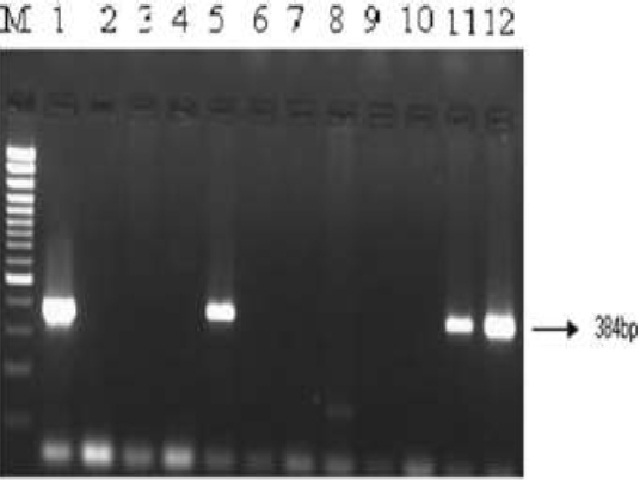 Direct detection of eaeA gene of enteropathogenic and enterohemorrhagic E. coli in stool samples by PCR. Lane M, 100 bp DNA ladder (Genetix); Lane 1, Reference strain EDL 933; Lane 2, Negative control strain; Lanes 3‑12, Stool 91 to Stool 100; Lanes 5, 11 and 12, Stool samples positive for eae genes.